Notes: Randy Sievers came up with his version, marketed by J. Fair, called Randy's Belly Boat Fly. 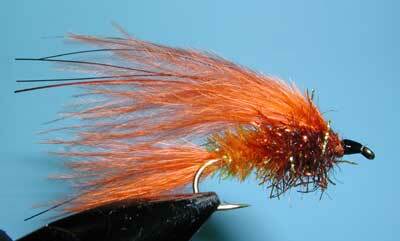 It is basically a Marabou leech pattern using J. Fair's Shuck material for the body. The pattern uses a 2XL nymph hook, Daiichi 1710, in sizes 6-10. This provides an ample hook gap without sacrificing shank length. The pattern is unweighted. 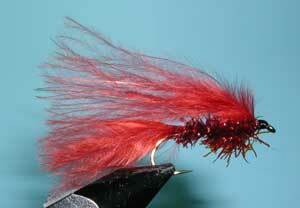 This is basically a marabou leech pattern with a nymphal body of a short shuck and a thorax of long shuck chennille. An overwing of flash provides additional reflection and attraction. 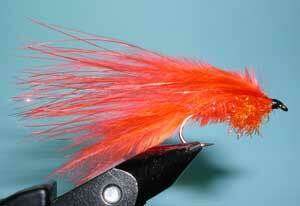 It is meant to be fished as a streamer with different retrieval patterns. Randy likes to tie this pattern using a 2XL Nymph Hook in size #6. Many similar patterns, such as the Mohair Leech or Marabou Leech, use a 3XL Nymph hook in sizes 8-10. Randy gets the same shank length with a size 6 2XL but a wider gape. This extra gape can be important in getting better hook-ups. 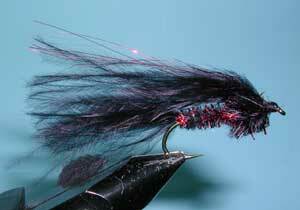 The wing of marabou tied in front of the body offers plenty of sinulous action.